I initially thought Never Eat Alone by Keith Ferrazzi (Amazon) is a book purely about business networking. You often find these types of books are full of unrequired filler and stories that perhaps would be more fitting in a long-form article, blog post or even a TED talk. Once you have the gist of some books you can leave them unfinished safe in the knowledge you understand the central premise of what they are attempting to tell you. I assumed Never Eat Alone was going to be one of those books. After all, why would the topic of networking need to be covered in a full book? A chapter, maybe, but not an entire book. As it turns out, this is one of the most practical books I’ve read in a long time. And rather being a book about business networking it is more a philosophy to business and life. I frantically made notes throughout which I’ve re-read more than once and will refer to again. I enjoy reading books which contain practical takeaways that I can use in day to day life. Never Eat Alone has this and more. The book’s author, Keith Ferrazzi is an entrepreneur and ex CMO to Deloitte and Starwood Hotels. The latter of which he was youngest CMO of a Fortune 500 company at the time. The book is actually not about networking (a term Ferrazzi doesn’t like or use) but rather it’s a strategy to help you establish long-term healthy business relationships. It’s about being helpful when there are no immediate benefits to you. It’s about connecting different people in your network so they can benefit from knowing one another. And it’s about being the best person you can be to be of value to those you work with and serve. The book’s central theme is that relationships in business are everything. As Ferrazzi points out, no man is an island and neither is any business. Never Eat Alone hammers this home and points out that while this is obvious to most people they go about it the wrong way. People tend to network with other people to discover what they can get out of a potential relationship. Ferrazzi says this is wrong. The keys to success in building long and lasting business relationships we must first lead with generosity. We must do what has been written in ancient scriptures, religious texts and passed down for millennia: we have to give before we receive. As Ferrazzi points out, generosity works both ways and as well as being generous of ourselves we have to be willing to accept it and indeed ask for it. Relationship building is both a philosophy and something that requires practical action and the book is ladled with useful tactics throughout. Don’t keep score, build a network before you need it, always keep in touch, be useful, expand your circle, connect mutual acquaintances, join clubs and be good at the art of small talk and more are all included in the book as chapter-worthy tactics. The book points out that all of this takes work. There are no quick fixes when it comes to high-quality business relationships. There is a lot of sweat equity involved. The internet is all about speed and brevity and while it may make communication efficient it’s not an effective platform when it comes to making genuine connections. Social media, email and so on can only help so much. Real-world communication and interaction are where the magic lies. Perhaps one of the best pieces of advice in the book (which there are many) is to be someone interesting yourself. Ferrazzi says you take the responsibility of being someone worth talking to or better yet talking about. To be interesting, expand your worldview, read up on what’s going on in the world, travel far and wide, have hobbies and develop new skills. As Charlie Munger said, become a continuous learning machine. Think about it, gone are the days of kings, barbarians and colonists when power was taken. We are now in an era of where power is given. To the extent to which it is given depends on how we can advance other people. When you read the book you’ll likely find yourself nodding along in agreement as much of it is common sense and inherent truths we already know deep down. The book is more of a reminder as to what is important in the interconnected worlds of business and life and how it’s relationships, not technology, not IP, nor anything else, which is important in the long run. In the era of digital communications and social media, it’s all-too-easy to assume you’re connected to people without putting in the time and sweat equity. A retweet here and a like there does not sustain a business relationship. 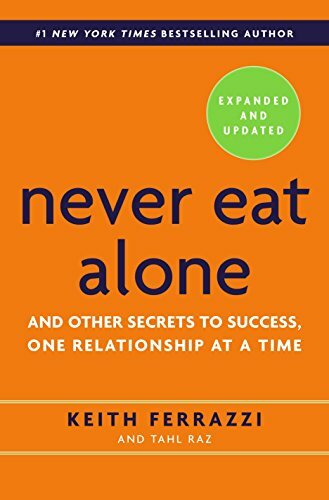 Never Eat Alone brings this all home and provides a strategy and tactics you need to establish, nurture and grow business relationships for the long term. It’s a book I’ll be referring to from henceforth and will no doubt read Ferrazzi’s follow up book Who’s Got Your Back which expands on this one.